To access a website is not difficult. However, in today’s time-crunched world, most people actually don’t have a minute to spare. Therefore, it’s such a requirement that your hurry pace extends to the realm of website design. You need to remember that even though you create a web design that’s worth a wait, visitors aren’t likely to stick around with a slow download speed. Try to satisfy your users’ demand by creating a web design to help fasten your website as well as easily accessible to user. How? Check these tips out! The first thing you need to do in order to have a faster website is creating a website lighter. A heavy web page is one of the major reasons why your website loading process takes a long time. Therefore, it’s important to get rid of all that’s waste. Put in mind that the smaller a web page is, the faster it will load. Look thoroughly at your website, if there are videos or images that are completely not relevant to your content, make sure to delete them instantly. A lighter website will more likely gain more visitors. A classic example of style over substance is flash. While it ultimately has its place in professional web design, it has to be used sparingly when you make a website. Your visitors might have the right flash player. However, it will boost your site’s download time. Moreover, flash is also one of the website design elements which not yet accessible to search engines. Because of this, it’s not going to faster your website but only hinder your search engine optimization efforts instead. You can make your website load faster by creating a CSS Sprite. This tip is applicable if your website has a bunch of small graphical elements. An image sprite is a collection of images put into one single image, while CSS is used to show only the image’s portion that contains a button or icon. It can speed up your website loading since each HTTP request has a certain amount of overhead time needed to negotiate the connection to request a specific file from the server. In comparison to graphic text, HTML is much faster. However, there are a lot more ways for you to make it even faster. You can begin with watching out for extraneous HTML coding. Pay attention to spaces and unnecessary tags or even white space that can increase your files size. Remember, less is more. To help your website work faster, try to use defaults for tags or remove them wherever possible. Probably, your website has the same script on a number of pages. Just wait before you make a separate script for each page. Once you make it, your website will have to read them every time the pages are loaded, which will take a lot of time. Hence, you need to use an external code which is a single code source for all web pages. It will ensure the code to remains in the cache so that the time taken for scripts loading will not be necessary anymore and help the page to load faster. Those are some web design tips for a faster website that you can follow. Remember, a website that takes a lot of time to load usually results in reduced user interest. That’s why it is essential for you to create a web design that can help your website to load faster. 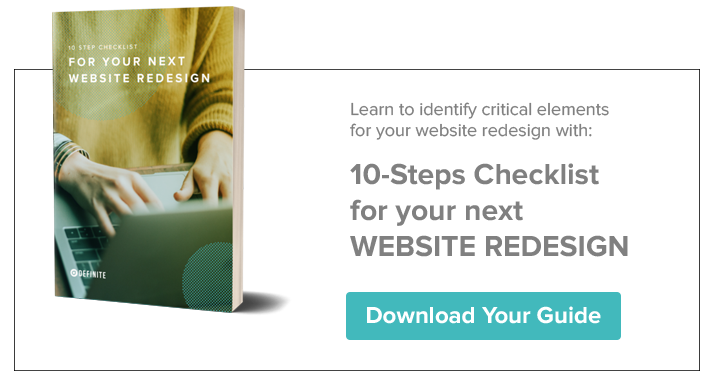 While we’re on the topic, don’t miss out our 10 Steps Checklist for Your Next Website Redesign guide to help you identify critical elements about website revamp!